The central stream of Seoul’s Han River saw the season’s first ice formation on Friday, the earliest in 71 years, as frigid temperatures continued. In 1946, the first ice formation on the river was observed on Dec. 12. 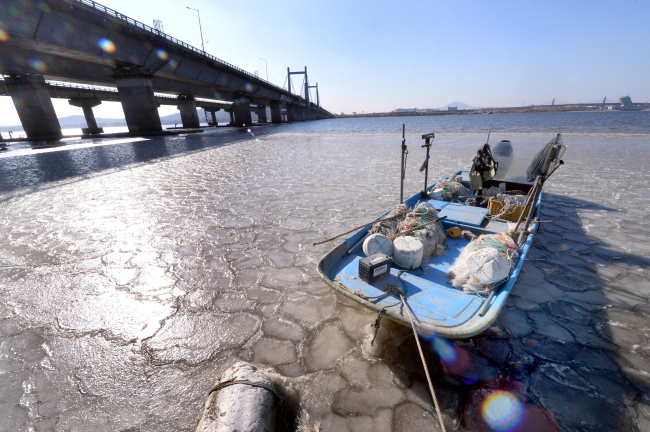 According to the Korea Meteorological Administration, this season’s first ice formation on the river took place 42 days earlier compared to last winter, when it occurred on Jan. 26 this year, and 29 days earlier than the average. The date of the first ice formation is measured according to the earliest freezing of the Han River’s surface beside the central spans of the Hangang Bridge. Temperatures in Seoul fell to morning lows of below minus 10 degrees Celsius for four days since Dec. 11. Daytime highs remained below the freezing mark. On Friday, the morning low marked minus 7.5 degrees C in Seoul. Ever since observations of ice formation began in 1906, the earliest date of ice formation on the Han River was Dec. 4 in 1934. The latest was Feb. 13 in 1964. There have been seven times when no ice formation was observed, most recently in 2006.